VATICAN CITY (CNS) — Celebrating a Mass in his native El Salvador, newly created Cardinal Gregorio Rosa Chavez said his first major assignment will be to travel to South Korea for a meeting on how to achieve peace with North Korea. 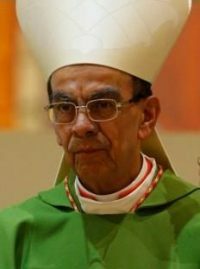 During a homily in San Salvador’s Metropolitan Cathedral July 8, Cardinal Rosa Chavez said that although he will “continue to be the least of my brother bishops” as auxiliary bishop, he is also entrusted to other matters by Pope Francis. “I already received my first invitation to go to Seoul, South Korea, to attend a meeting to see how we can achieve peace between North and South Korea,” the cardinal said; his remarks were followed by applause and cheers by the faithful. Tensions continue to escalate in the Korean peninsula after North Korea conducted its first successful intercontinental ballistic missile test July 4. With an estimated range of 5,000 miles, the missile is capable of striking the U.S. mainland with a nuclear-tipped warhead. In response, the U.S. and South Korean military held joint drills in a show of force against North Korea. However, under the leadership of Kim Jong-un, North Korea has shown no signs of de-escalating its nuclear ambitions. Cardinal Rosa Chavez, who worked closely with Blessed Oscar Romero before he was assassinated in 1980, was praised for his role in negotiations that brought peace to El Salvador after 12 years of civil war. “Cardinal Gregorio Rosa Chavez was someone who collaborated extensively in the peace treaty in El Salvador because he was the only Salvadoran who participated in every single meeting between 1984-1989,” the ambassador told CNS. His participation in negotiations between the Salvadoran government and the Farabundo Marti National Liberation Front, he said, “culminated in the signing” of the Chapultepec Peace Accords in 1992. Acknowledging that the conflict in the Korean peninsula is “a bit more complicated” and “won’t be resolved in one day,” Lopez told CNS that Cardinal Rosa Chavez’s experience can help bring both sides to the negotiating table. “I’ve known him for many years and he is such an authentic person in his simplicity, in his way of being close to the people; he was an auxiliary bishop but always close to the people, with the smell of the sheep as Pope Francis says,” Lopez said. “Even though he said he was going to return to his normal activities, I knew it wasn’t going to be that way. The pope saw in him something greater to have given him more duties in the course of his pontificate. That is my opinion,” he said.